THIS GIVEAWAY IS CLOSED! THANK YOU TO EVERYONE WHO ENTERED! You, my wonderful followers, have earned it! For using my coupon code ANL91 ten times, Born Pretty Store is hosting a giveaway here for you! The prize is $20 worth of product from Born Pretty Store. The giveaway will be open for 4 weeks: May 14, 2013 - June 11, 2013. A winner will be chosen by June 17th and notified via email. If the winner fails to respond within 24 hours, a new winner will be chosen. 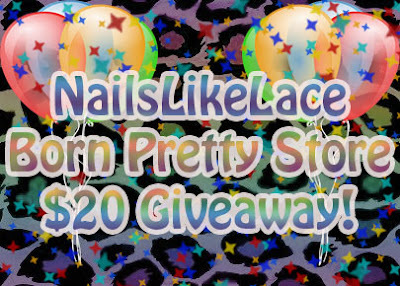 Born Pretty Store ships worldwide, so this giveaway is open internationally! You must follow Born Pretty Store via at least one of the ways listed on the Rafflecopter widget. This is mandatory. Each additional follow is an additional entry. You must follow NailsLikeLace via at least one of the ways listed on the Rafflecopter widget. This is mandatory. Each additional follow is an additional entry. You may tweet about this giveaway once a day for two entries per day/tweet. You can also comment on this blog post answering the question in the Rafflecopter widget for two additional entries. Obviously, if you cheat you are going to be disqualified, so let's not even go there.